There’s nothing like starting a new year with a huge download of intel and inspiration to fuel your next 12 months. 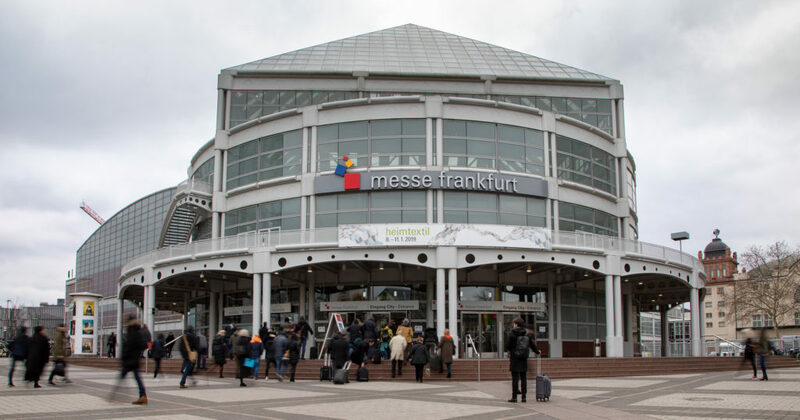 Such was my trip to Heimtextil January 8 – 11th this year, as a guest of Messe Frankfurt. I was advised by industry friends, who attend each January fair, how to organize my days by halls, and that I’d need all four days to reap the full rewards of the show. 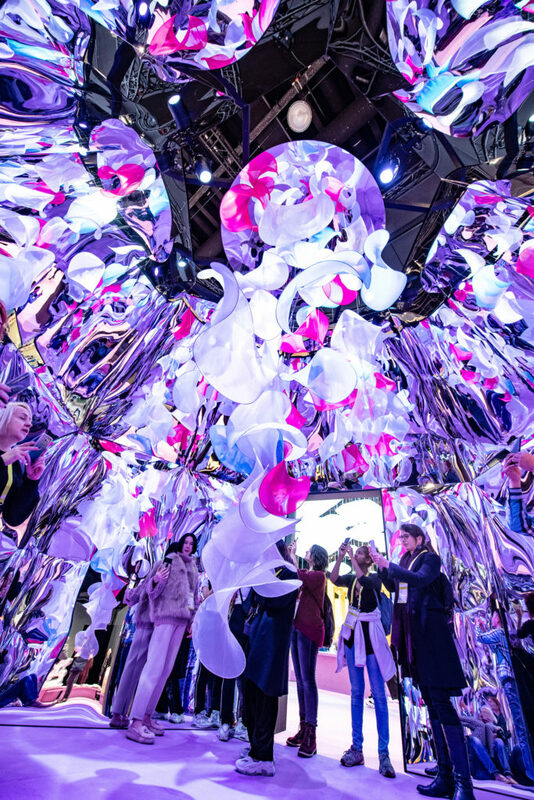 Even with fair warning, I couldn’t have imagined the enormity and scope of the MESSE (fairground) — so a little jet lagged, and espresso fueled, armed with my camera and iphone, I set out to assimilate a global textile wonderland. 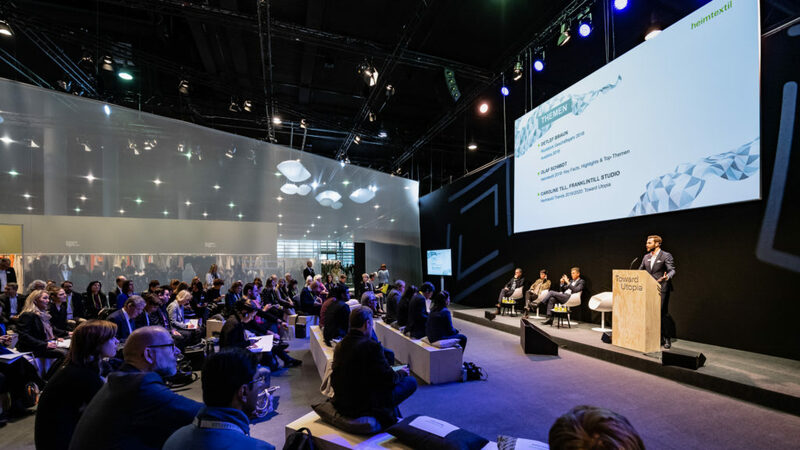 The Heimtextil team does an exemplary job helping navigate the show and opened the fair with a press conference discussing global market trends, explaining the concept behind the new, more easily-navigable halls, and presenting an overview of their 2019 theme — Toward Utopia. 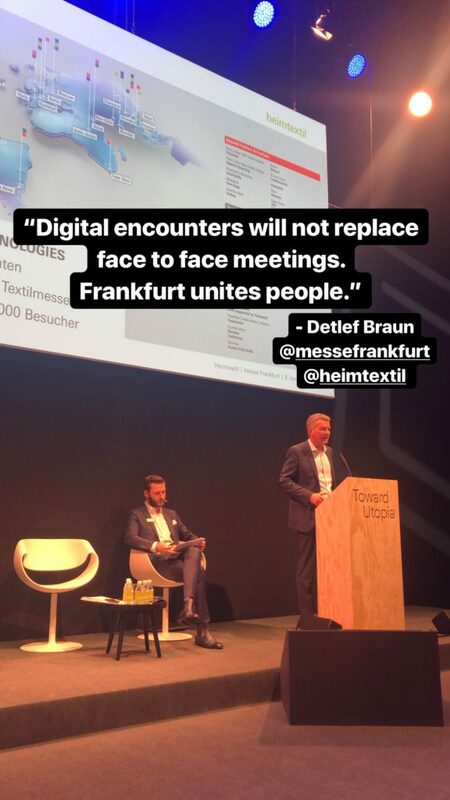 A reason why Heimtextil continues to grow, noted by Executive Board member Detlef Braun, is because there is an ever increasing need in business for face-to-face interactions in response to the digital age. 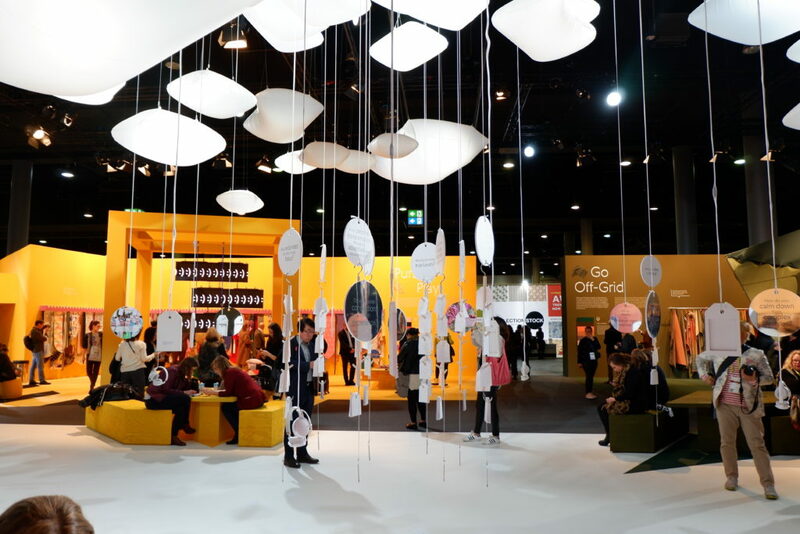 Heimtextil grew this year to 3025 exhibitors from 65 countries as a result of this need, and also the very unique global mix of product sought after by 67,500 attendees. 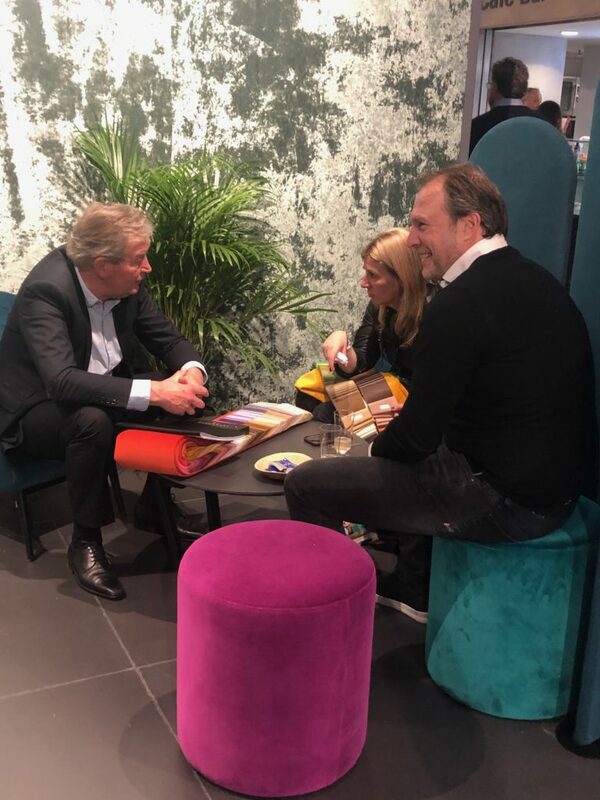 Thimo Schwenzfeier, Director of Marketing Communications for Heimtextil, told us the story of how the Trend Space evolved.The origins of the Heimtextil Trend Space was established more than 20 years ago. At the beginning it was a classical trend area with highlighted colors, materials and patterns. But over the years we saw an increase in interest, both from exhibitors and visitors. So, we invested in it to make it more relevant. 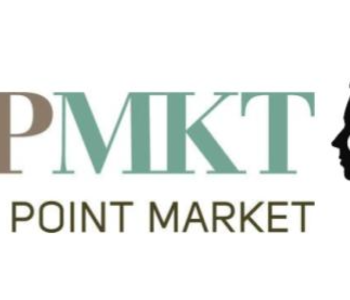 In 2015, we established the very first Heimtextil ‘Theme Park’ and it was the heart of the trade show. 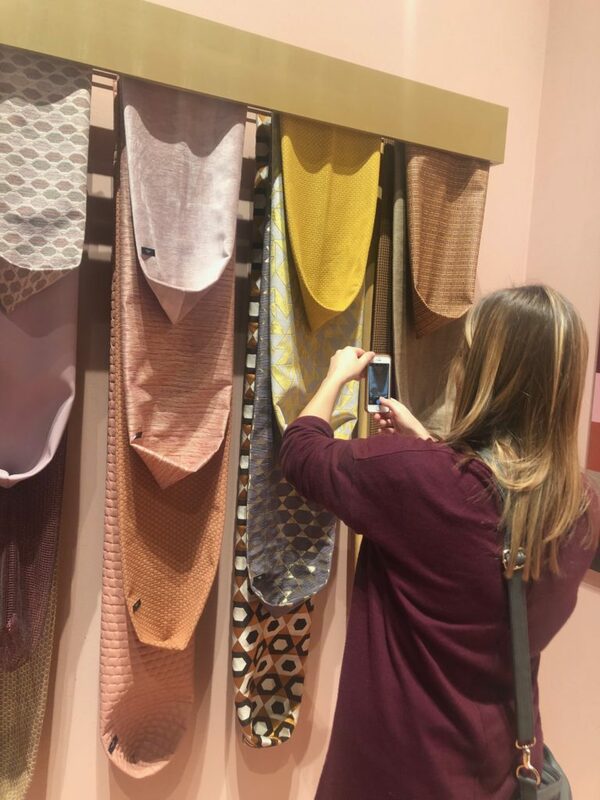 It is now called the Heimtextil Trend Space with more than only colors and materials, it presents relevant meta topics about lifestyle, sustainability, retail, product innovations etc. and is an ideal first stop at the fair. 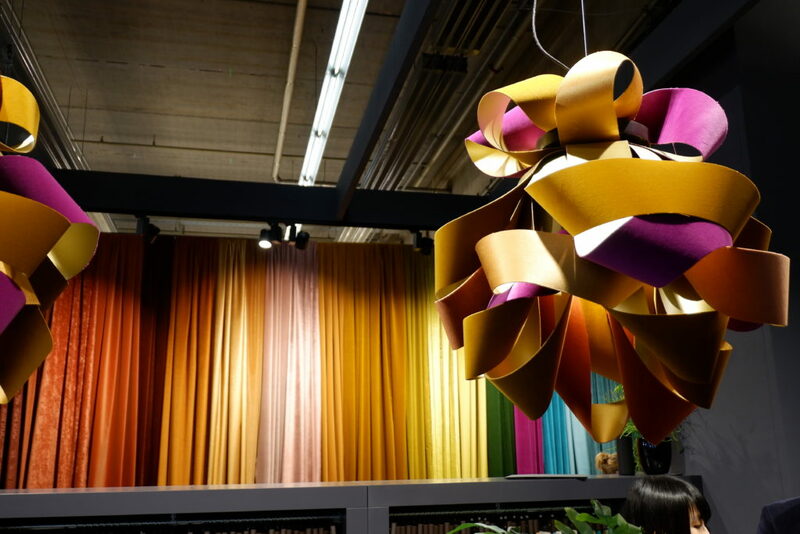 The origins of the Heimtextil trend was established more than 20 years ago. At the beginning it was a classical trend area with highlighted colors, materials and patterns. But over the years we saw an increase in interest, both from exhibitors and visitors, so we invested to make it more relevant. 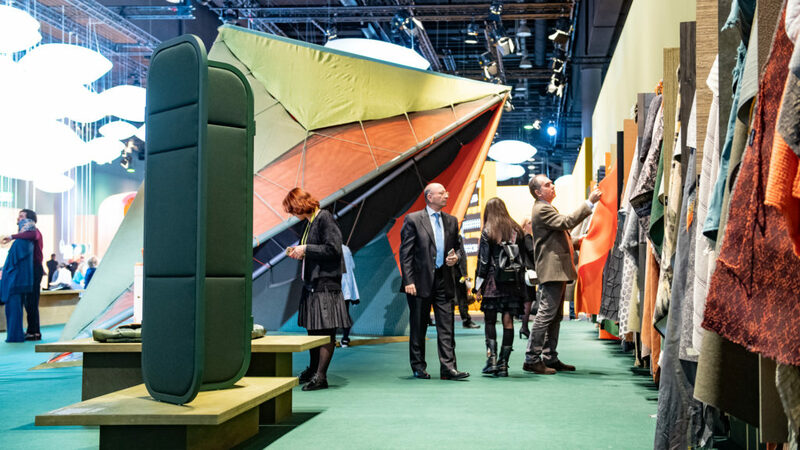 In 2015, we established the very first Heimtextil ‘Theme Park’ with a wider focus on globally relevant topics and it became the heart of the trade show. 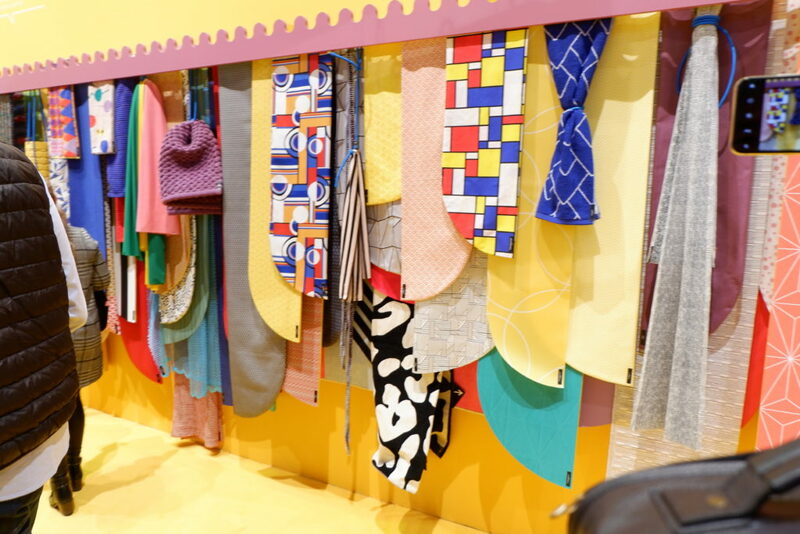 It is now called the ‘Trend Space’ with more than colors and materials — it showcases relevant meta topics about lifestyle, sustainability, retail, and product innovations. 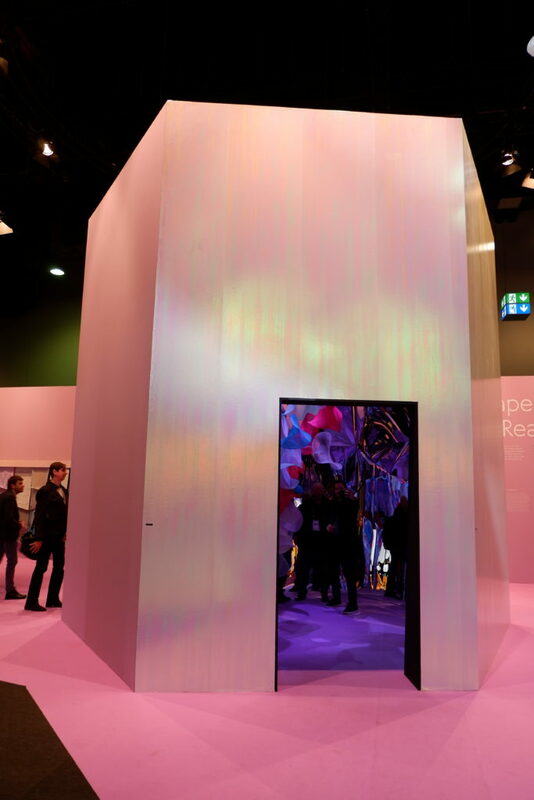 Today, the new ‘Heimtextil Trend Space’ is the ideal starting point to inspire and also educate yourself before exploring the big trade show. Caroline Till, co-founder of Franklin Till, a futures research and creative agency in London, leads the team developing Trend Space themes. She presented at this press conference and later met with our group of American journalists and bloggers, to further explain the theme, and substantiate the sub-trends. 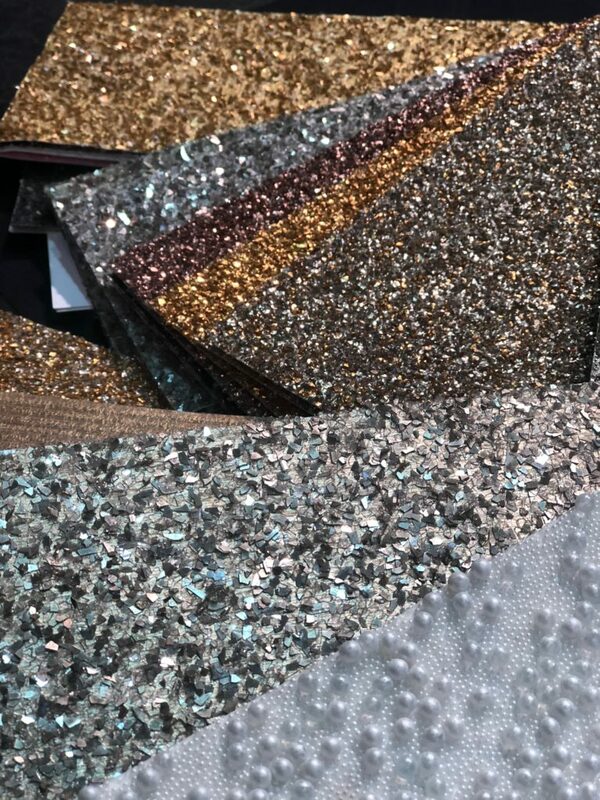 Toward Utopia attempts to answer how our highly connected lifestyle is impacting our emerging design landscape, how design is offering solutions and impacting evolving taste in colors, patterns, and aesthetics. 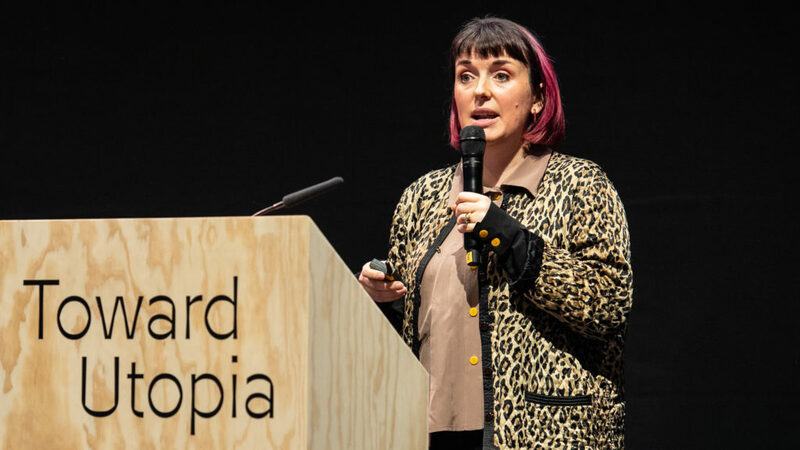 We want design to help us disconnect and want our interior environment to offer us a sense of sanctuary, whatever that means to us, our personal utopia. Full of curiosity after meeting Caroline, I started my exploration of Trend Space in Hall 3.0. 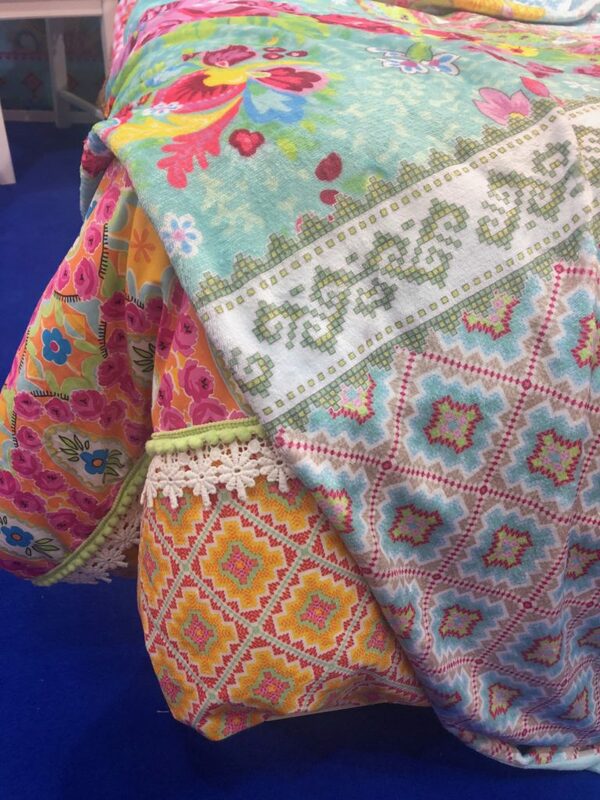 If you read my Heimtextil Preview, you got a glimpse of the themes. 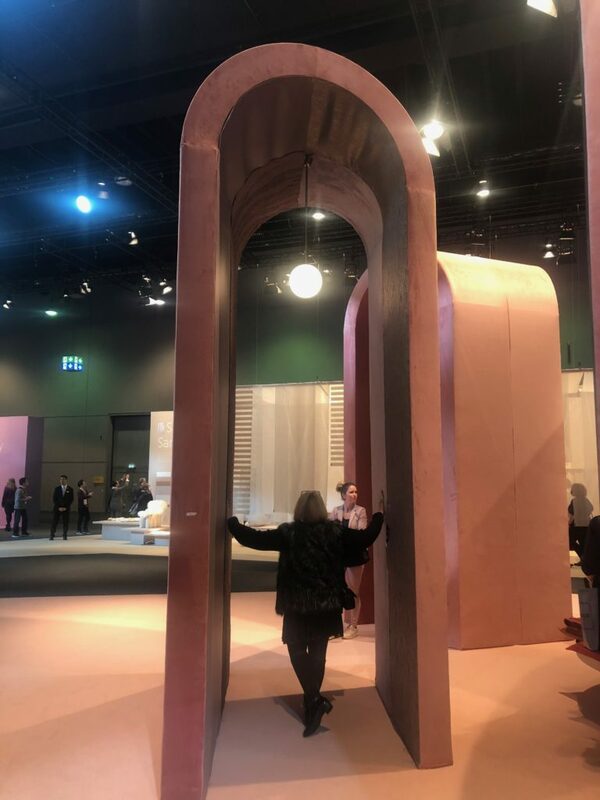 The installation for each theme was, by far, the most immersive, and interactive trend space I’d ever experienced: Embrace Indulgence, Seek Sanctuary, Go Off Grid, Escape Reality, and Pursue Play. 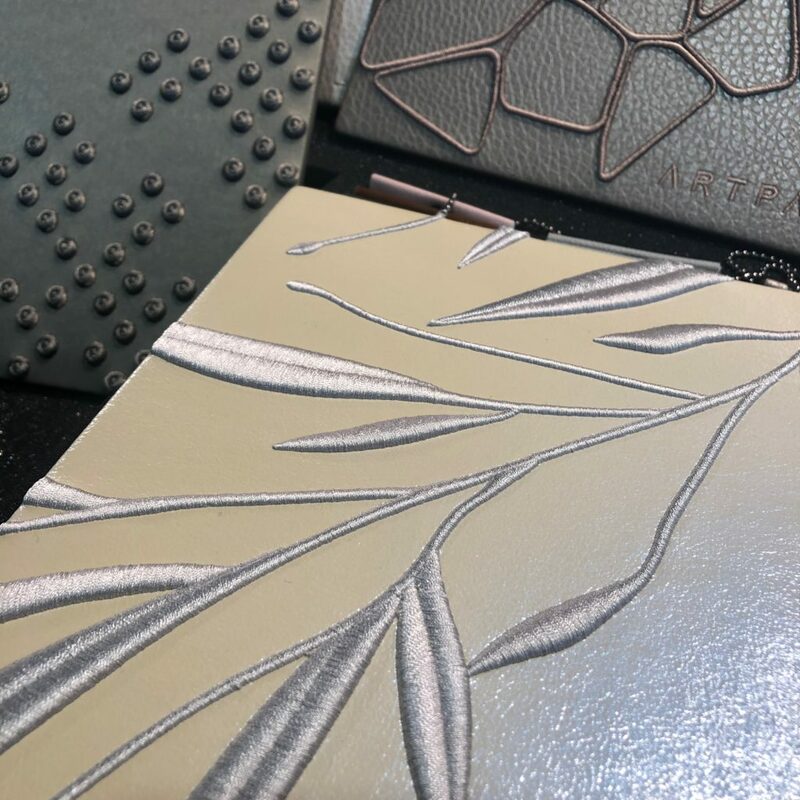 Rethink your attitude toward luxury by uncovering your personal ideals, combining rich materials and colors, and authentic craftsmanship in a modernist style. Immersed in complexity and information overload, we need to escape and have a more optimistic view of the future. Playfullness is a means to positivity. We can find refuge from the hectic pace of modern life as we create our personal sanctuary in our interiors and surroundings. We want to reconnect with the natural world and want technology to help us do this. Design is integral to this process. We can choose to escape our uncertain reality through controlling our virtual reality in a digital universe. To get a sense of the space, take my video tour, click below. 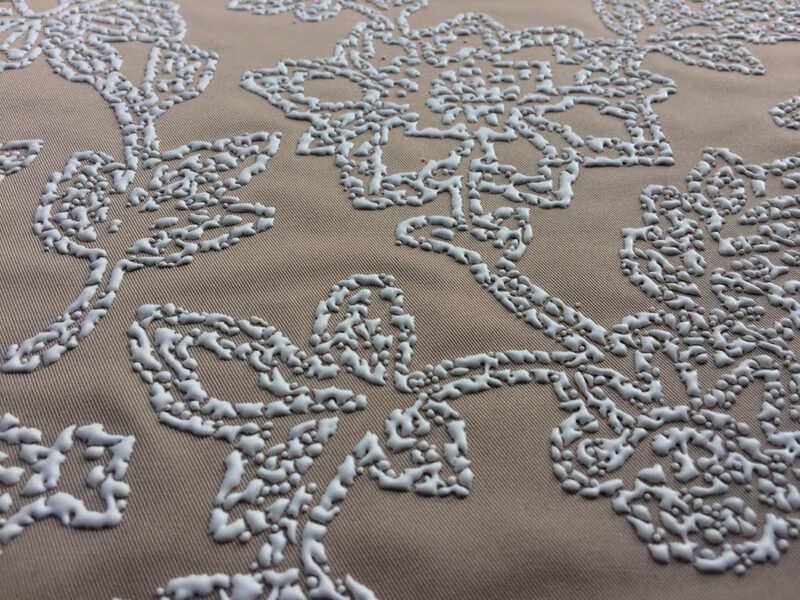 The beginnings of textiles lies in the design. 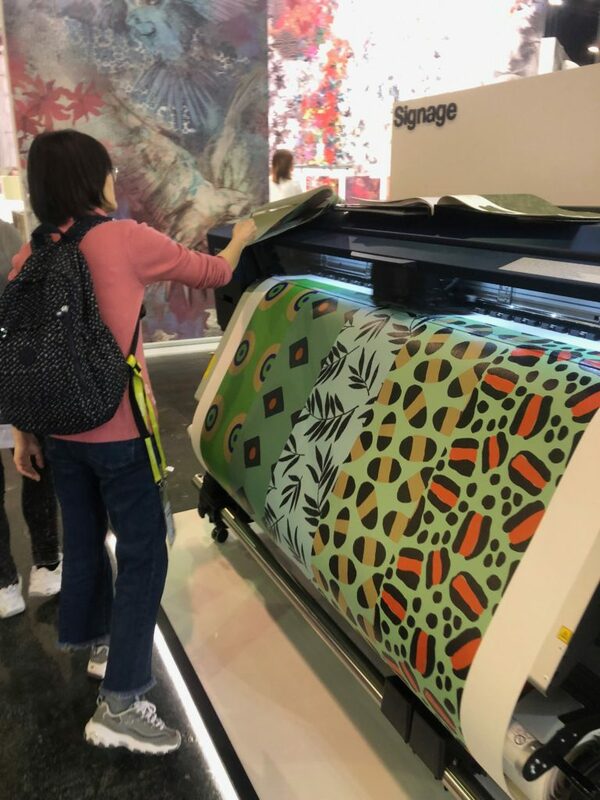 As a perfect segue from trend to process, Hall 3 housed the artists that create and sell designs to fabric manufacturers, converters, and product designers. 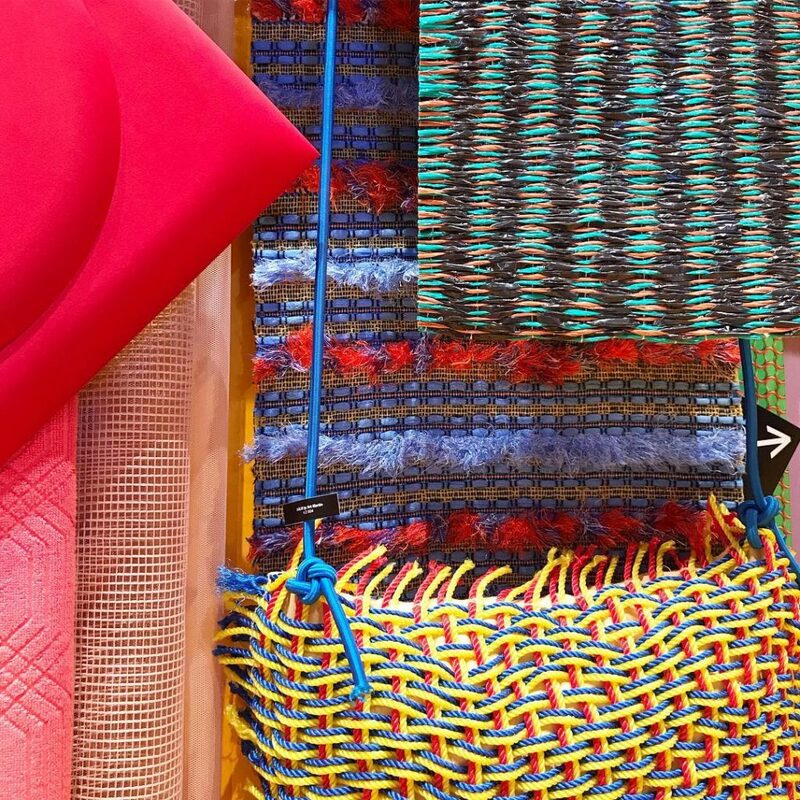 From hand and small loom weavings with innovative recycled fibers to cutting-edge laser, embroidery, and 3-D printing techniques, these studios lead the way for what we will see in the marketplace. I was also thrilled to meet some of the international studios I follow on Instagram. 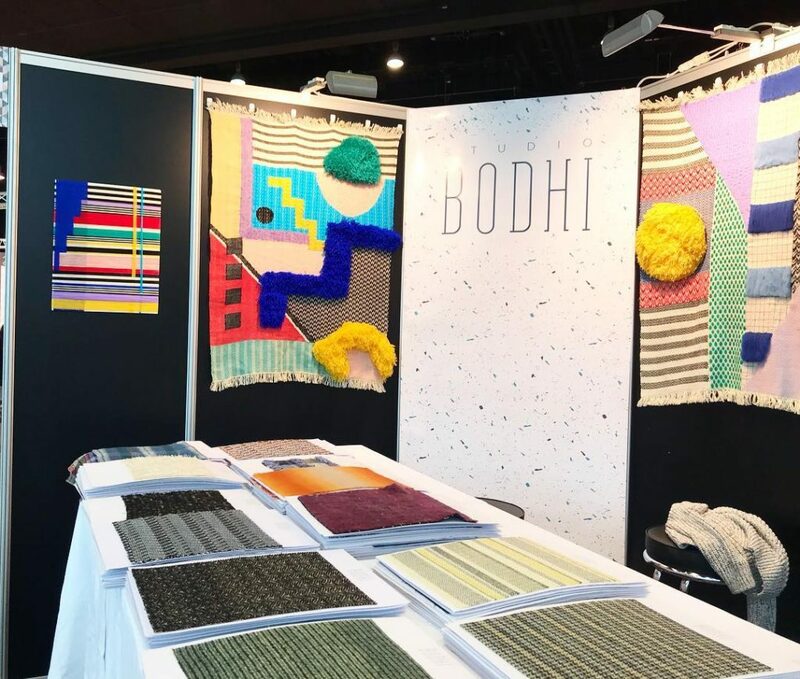 London-based Studio Bodhi specializes in design, advocating the use of sustainable textiles. Their work is beautifully dimensional. London-based Studio Bodhi specializes in handwoven sustainable textiles. Our designs at Studio Bodhi are all hand woven on a Dobby or table loom. We use a range of ethically sourced and recycled materials, this sample is made from locally sourced wool, recycled plastic netting and industry waste off cuts made from silk selvedge. 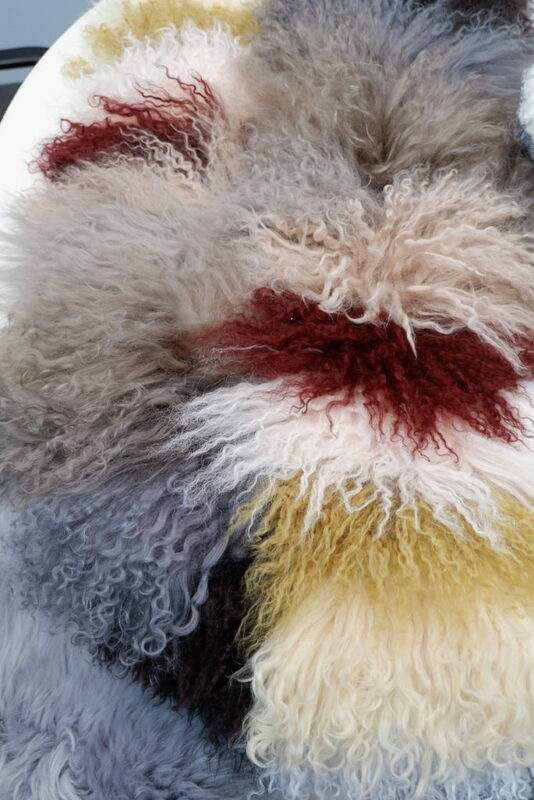 Rotterdam-based textile designer Eugene Van Veldhoven specializes in innovative fabrications. 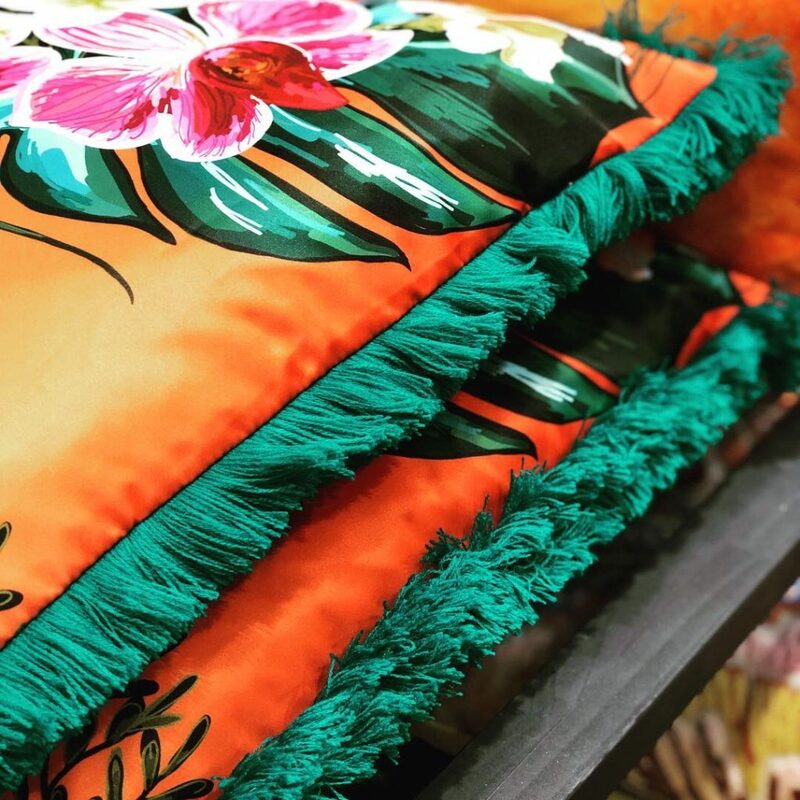 It was his 24th Heimtextil show and his pieces were stunning. He said that his clients reproduce his three dimensional work but often also translate them as prints or wovens as well. 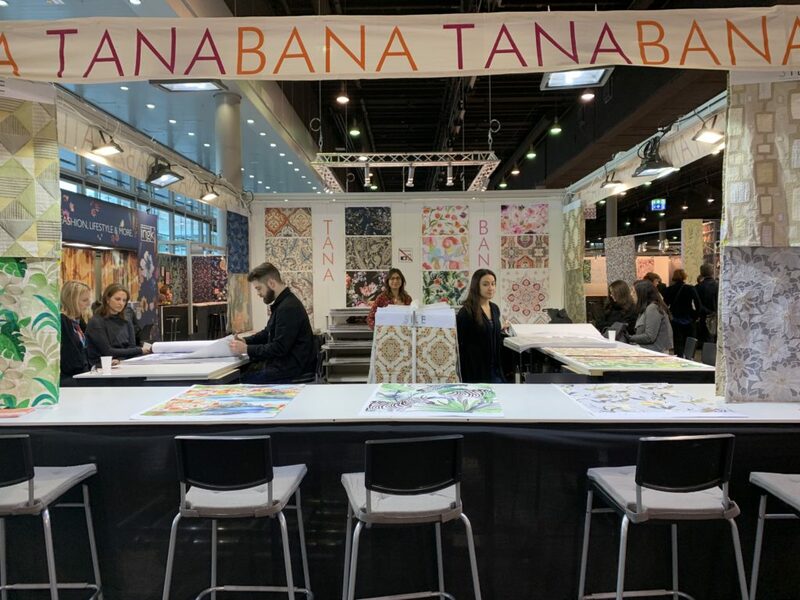 American company Tana Bana is a U.S. agent for textile design studios and independent designers from all over the world. They introduce over 100 patterns each month and have over a dozen artist working in India as support staff. It’s truly an international pursuit. 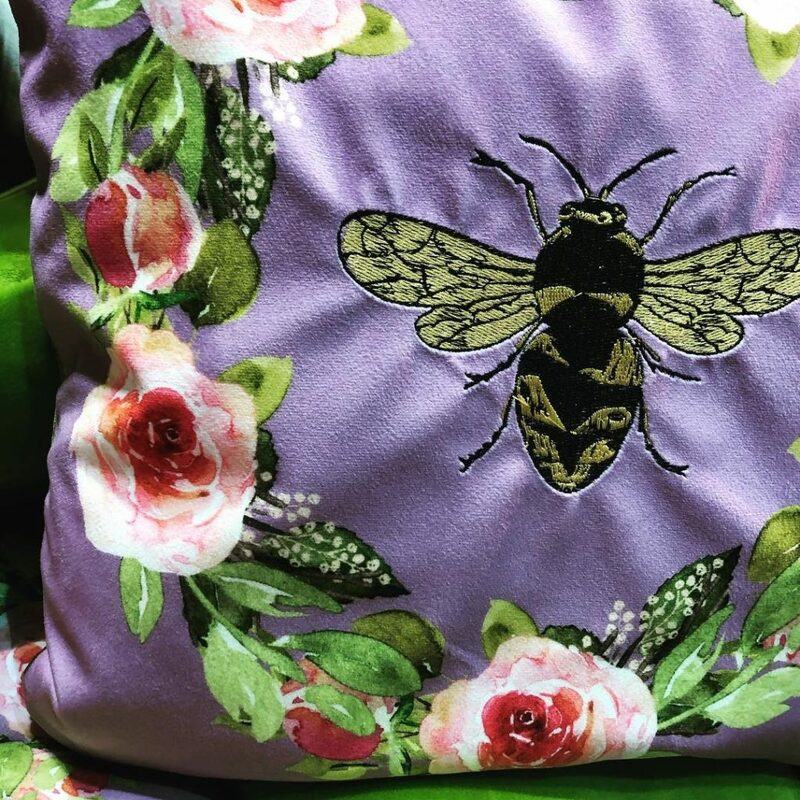 Also in Hall 3.0, we are introduced to the companies on the forefront of digital printing that have breathed new life into textiles. Creativity thrives as low yardage minimums, large scale repeats, and expediency of design, all come together on varied base cloths. Companies like Epson Italia are leading innovators. 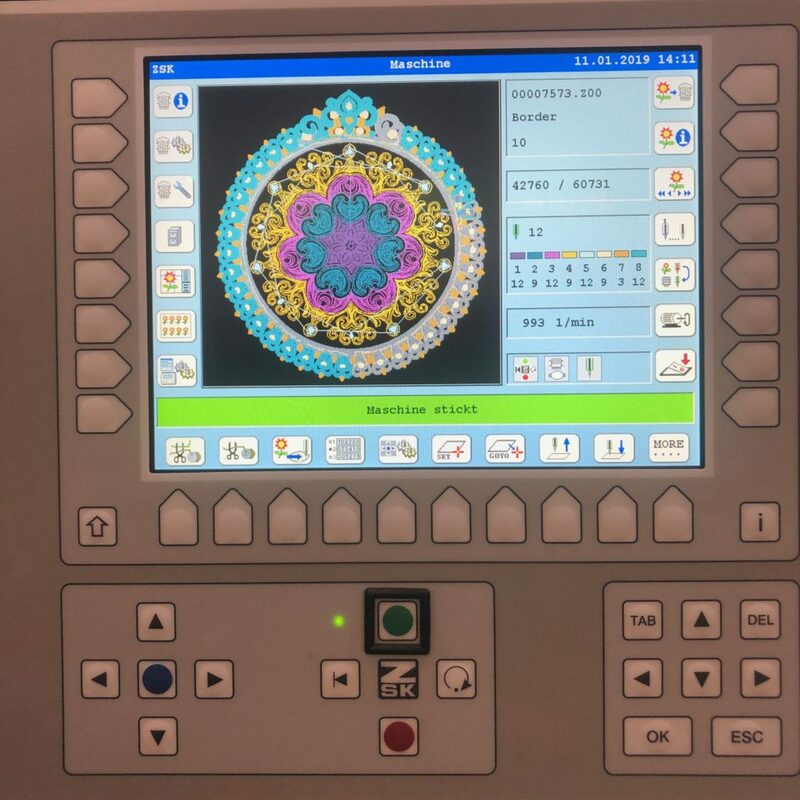 It’s no surprise that the embroidery machines par excellence are German, Zsk Machines were standouts. 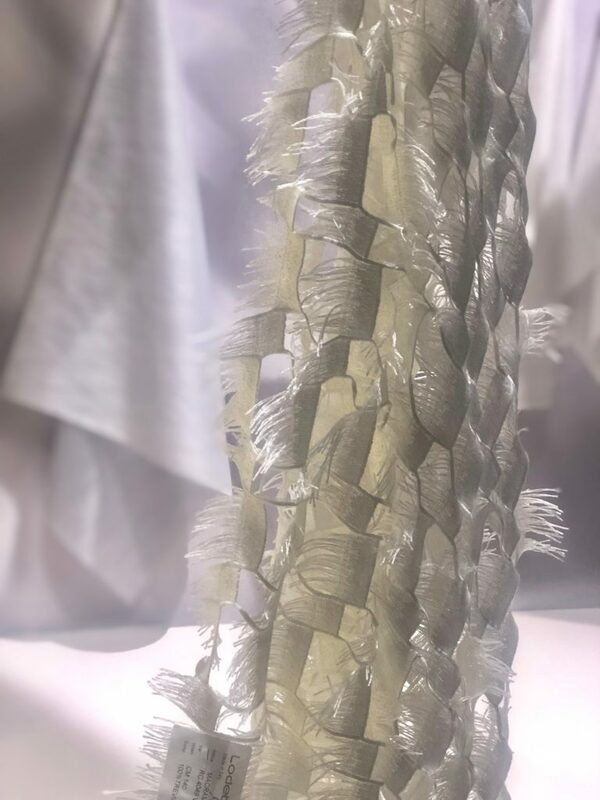 An innovating 100 year-old company, ZSK recently introduced the smallest tubular arm, allowing products with tighter spaces, or small border allowances, like shoes and baby clothes, full embroidery capabilities. 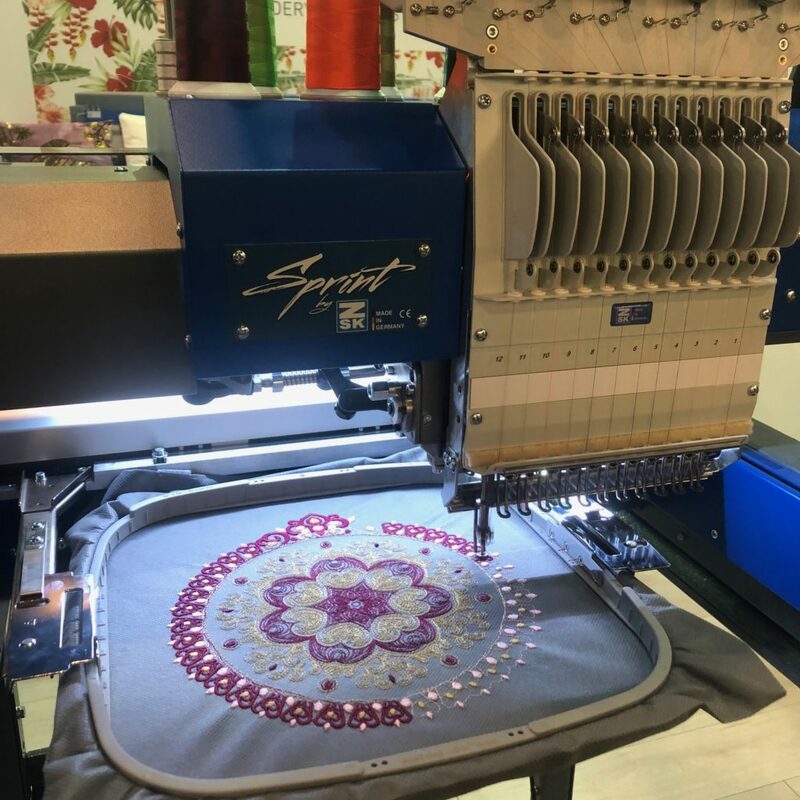 Their machines embroider with small cord, sequins, and/or rhinestones and are suitable for small businesses to high speed production. I was mesmerized. As I walked the various halls and absorbed the creative merchandising of the stands, I was struck by the more civilized pace of the exhibiting companies, in contrast to American shows. Here, attendees were encouraged to linger, have a discussion, take a coffee or snack: it was an environment for connecting. I had to adjust to this pace and allow more time for each hall. It was a happy accommodation. See interview below with Richard Oussoren of Raymakers, an official Royal Dutch textile mill. Learn about their history and process as velvet makers. They have also pioneered organic velvet production investing in sustainability. I met many #FringeFriends finally in real life. 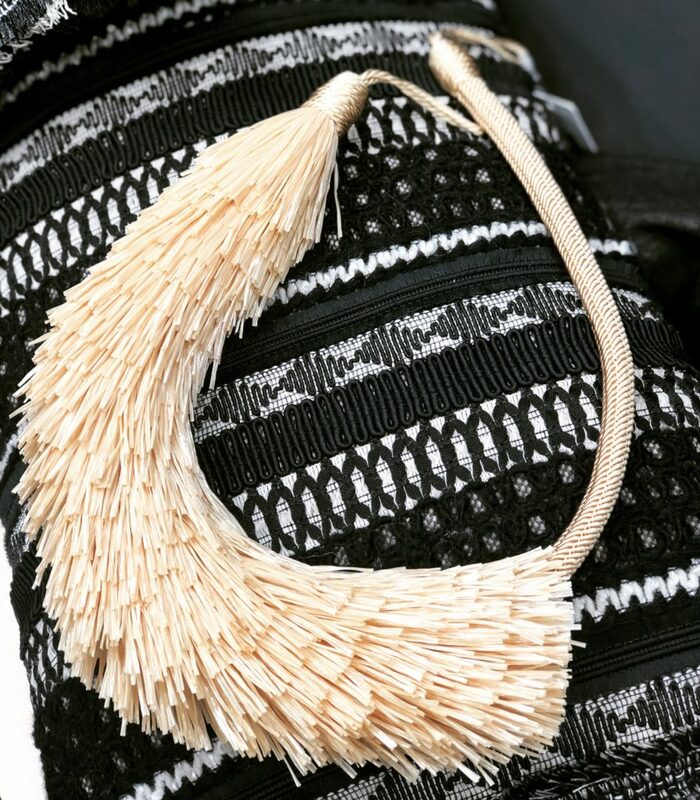 The Trimland team shared Turkish coffee and their latest tassels and trims. 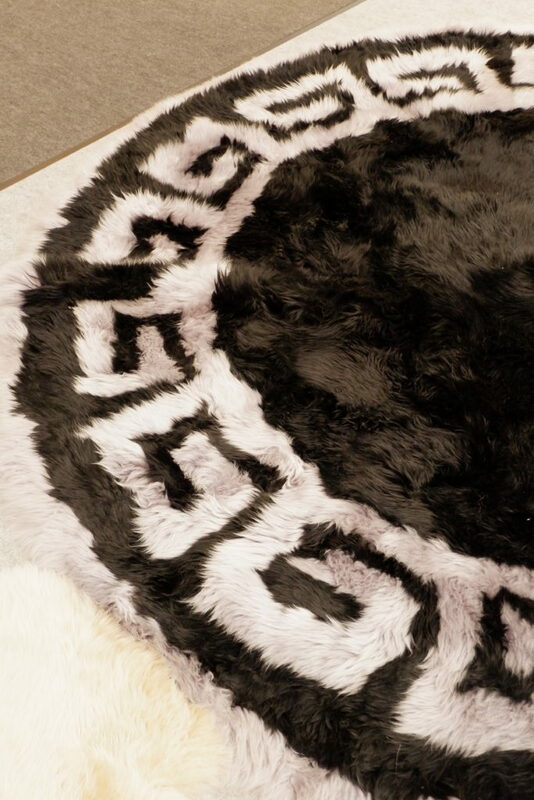 It was a pleasure to meet Tony Strang of Bowron who taught me all about New Zealand sheepskin, a byproduct of the meat industry, and the unique qualities of Icelandic and Mongolian furs. 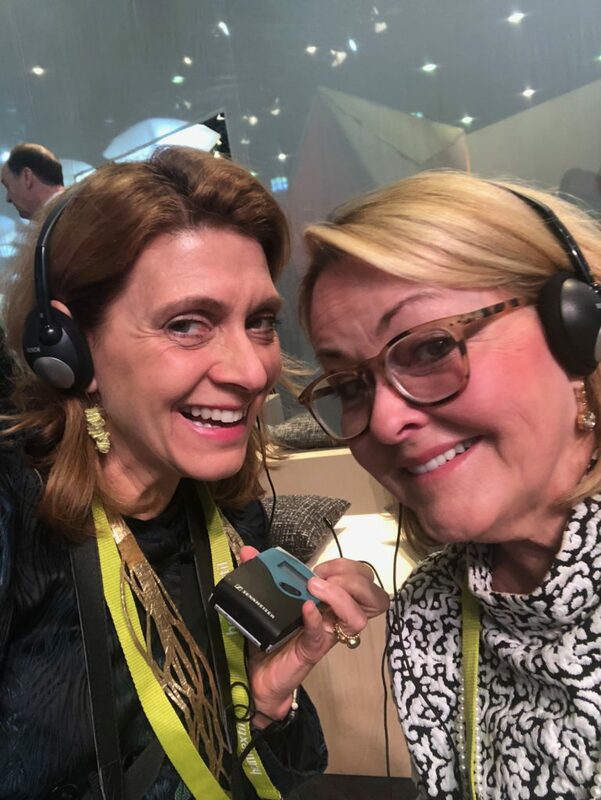 Click below to hear our interview. 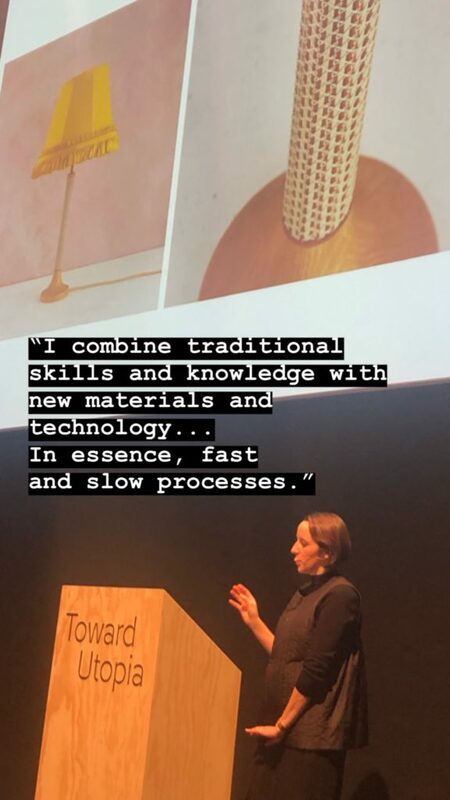 As part of Heimtextil’s extensive lecture series, I attended the presentation “Where tradition meets contemporary: Craft & process in textiles & interiors”. Presenter Aimee Betts is an accomplished mixed media textile designer specializing in embroidery and braiding. 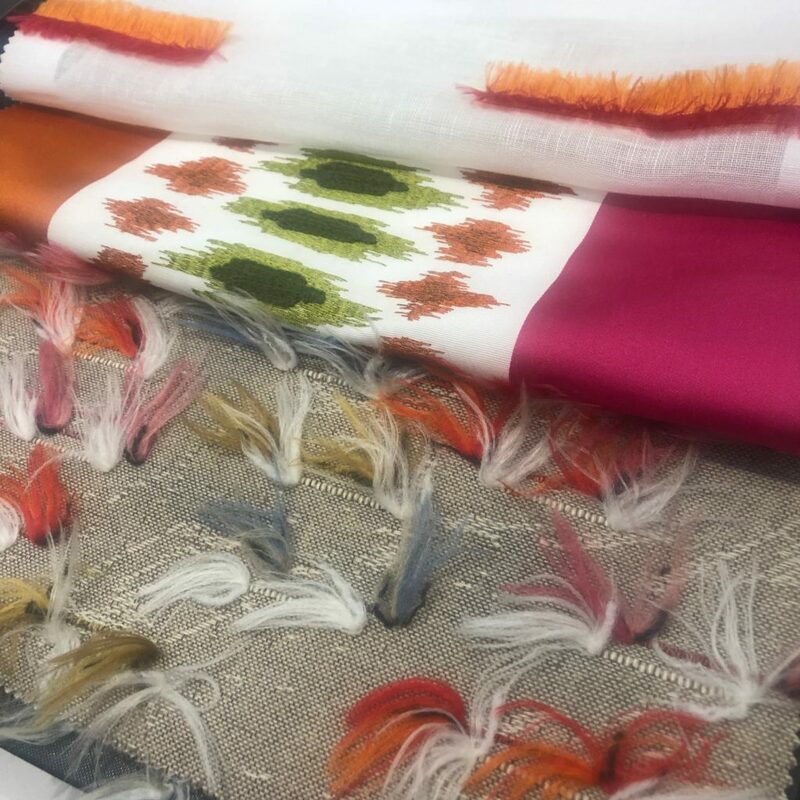 She is part of the resurgence of thriving artisan studios in London, producing custom products for interior designers and brand collaborations. 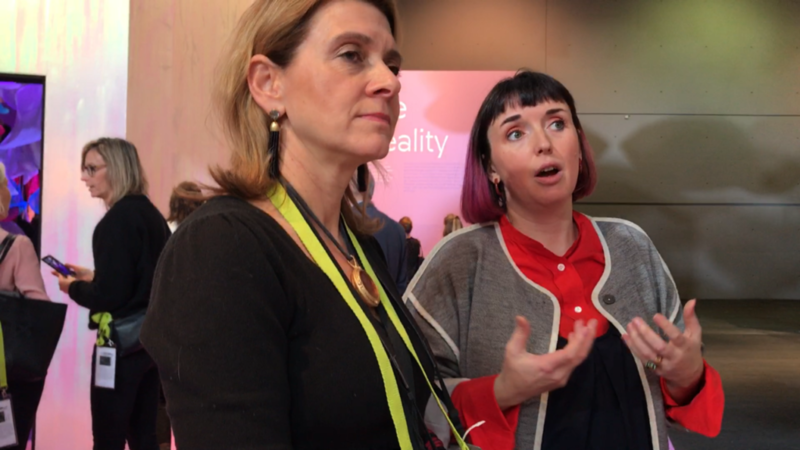 I was thrilled to meet her in person (since I had admired her work and met on Instagram) and we had the chance to discuss, at length, the evolution of craft, renewed appreciation and where opportunities for makers might lay. 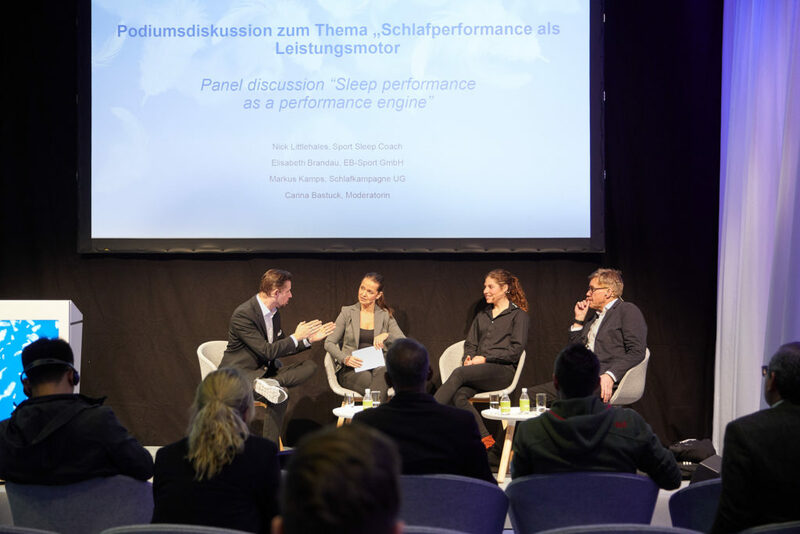 I also attended Sleep: The Future Forum discussing the analytics of sleep and how it affects peak performance. 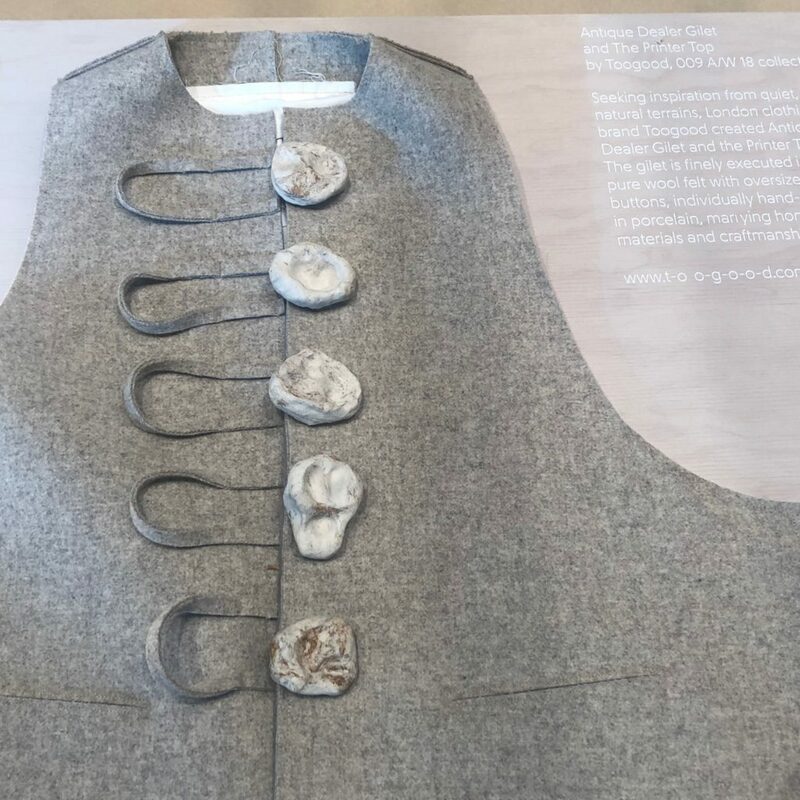 After four days of focusing on decorative textiles, embellishements, wall decoration and trends, a common theme emerged for me. My favorite products had an added layer of interest. 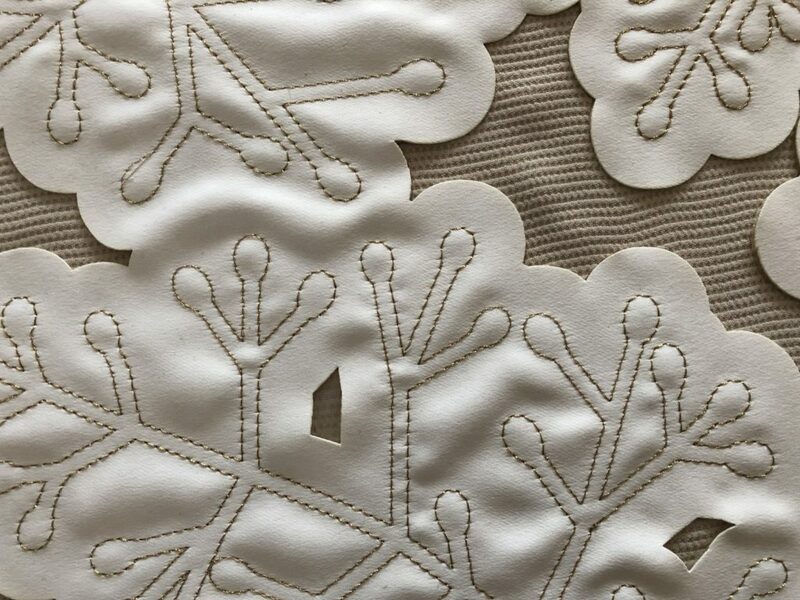 To the eye it was added texture — like embroidery on a printed velvet or wallpaper, a digital print of a handknit, embossing — something unexpectedly dimensional. As a backstory, it may have been artisan made, made with sustainable fibers or be a by product. Here are some of my favorites. 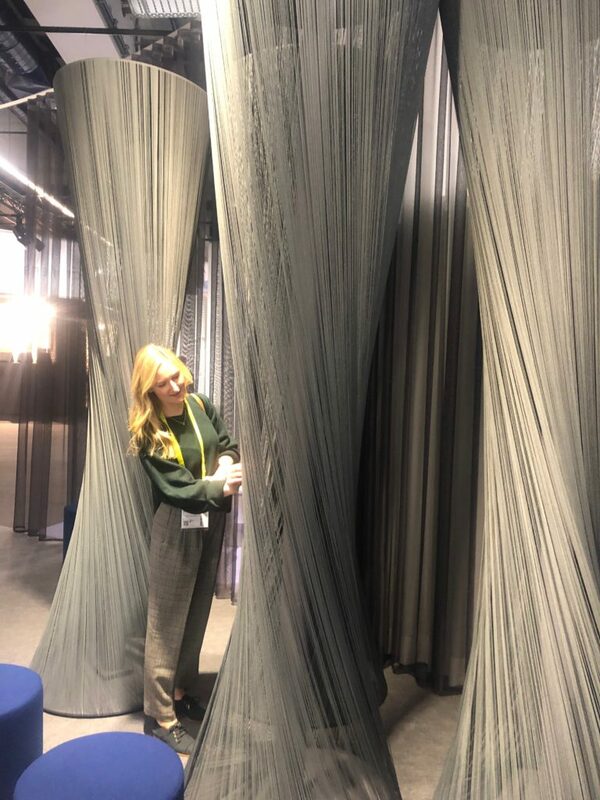 Tevira yarns create a fiber forest in Hall 4.2 of Interior Architecture and Hospitality. 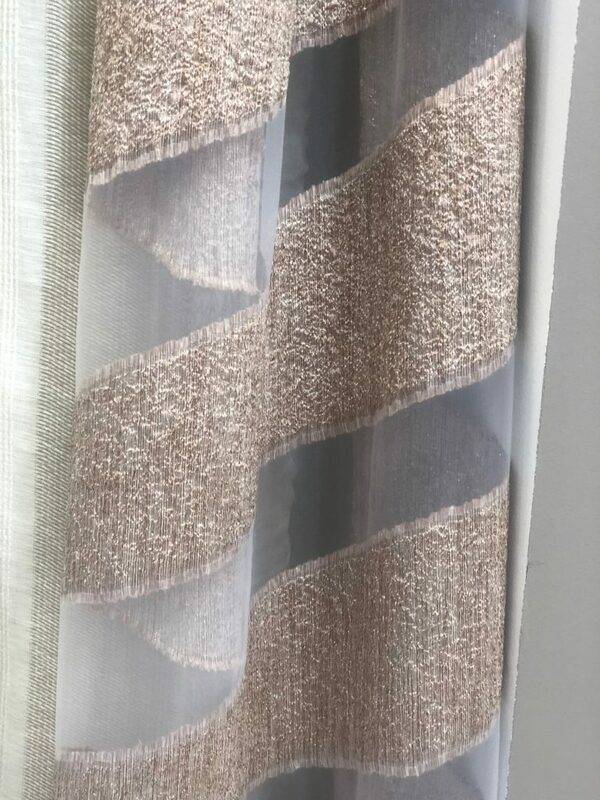 Italian manufacturer Lodetex specializes in textile weaving, printing, dying, and finishing. 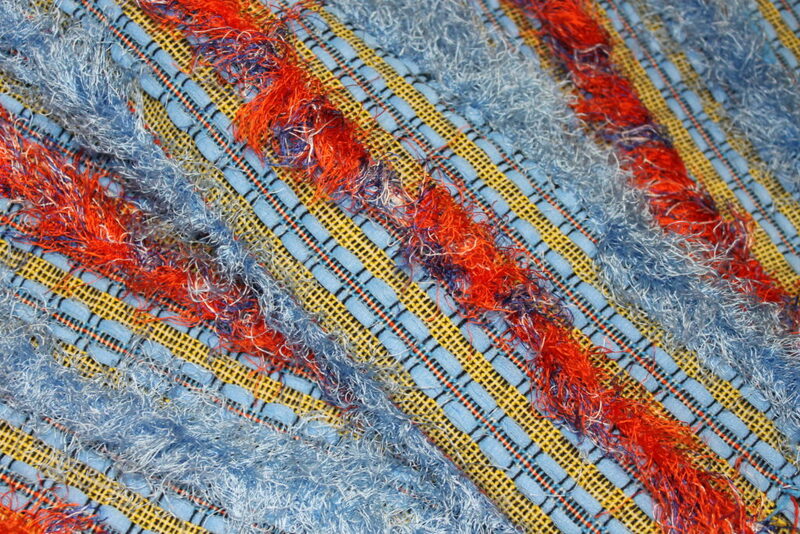 The fringed fabric is made with Trevira – an inherently flame-retardant yarn often used in contract fabrics. Passamaneria Italiana manufactures trimmings, accessories and running yardage combining various types of passementerie. They are one of the leading fashion trimming suppliers in Europe. 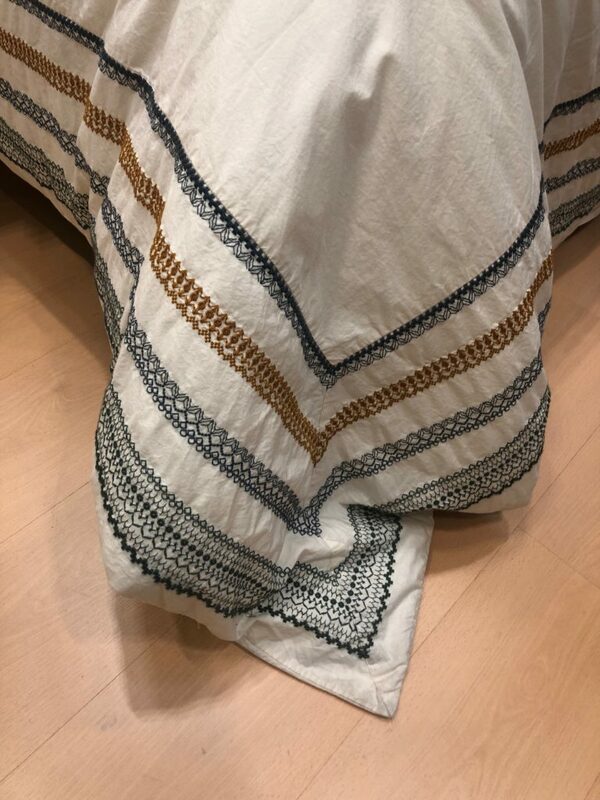 Zoom in on the beautiful, multi layered embroideries embellishing the bedding at Bovi Graccioza Hall 12.0 Bed & Bath Fashion. 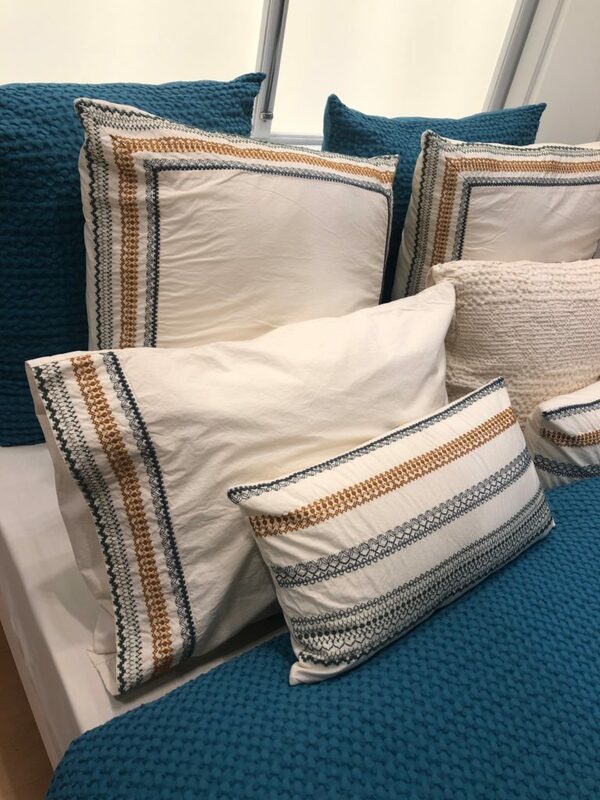 Netherlands-based Muller Textiles creates private label collections and this colorful bedding mix called “Happiness” is a patchwork of digital prints rendering crochet and cross stitch designs that is further embellished with trims. Muller Textiles bedding, cross stitch design with crochet lace and mini pompoms. 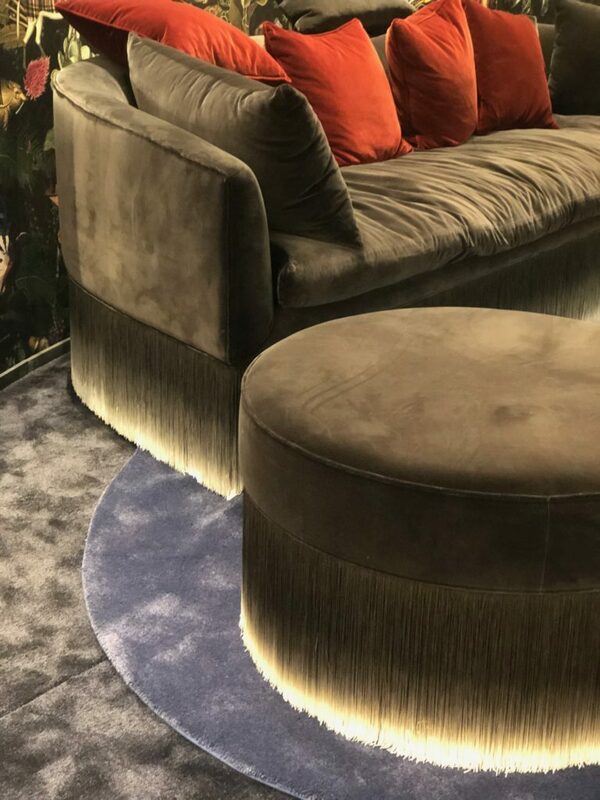 Traditional meets modern with a printed bullion fringe table skirt that made me look twice at AT Creation based in Moscow. In Hall 9.0 Beautiful Living, it was so busy at German Pad Concept that I only got to meet “Chief Dude” Michael Rossmann for a moment. I subscribe to his design philosophy. 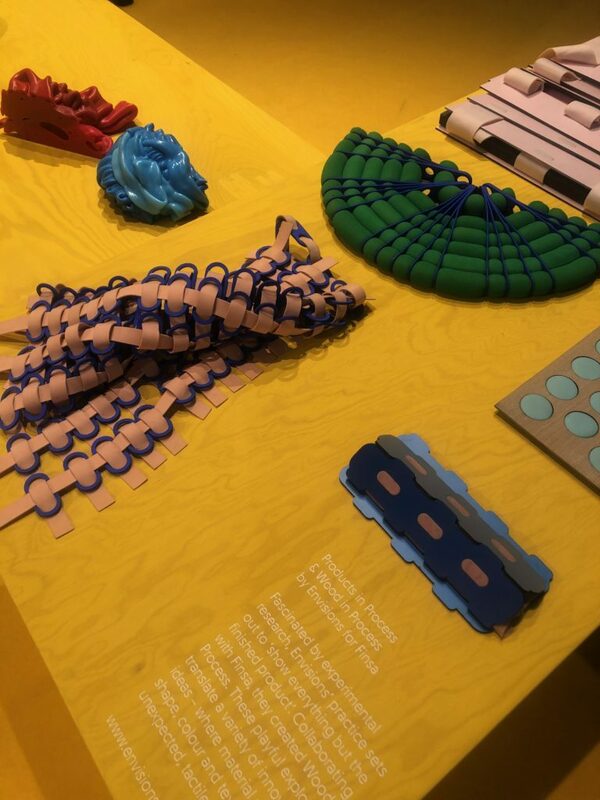 He designs these collections with colors, patterns and materials so people can create their own happy space. Belgian design at Wind showcases true global collaboration. 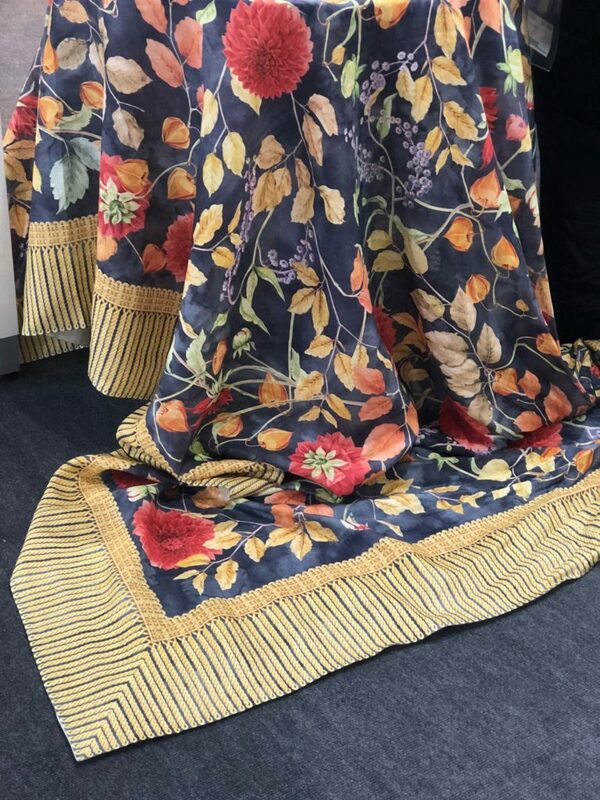 Working with the best mills around the world, these textiles use weaving, printing and embroidery techniques crossing borders for processes. In American, we would call this company a “jobber” or “distributor” for cut yardage. In Europe, Wind is called an “editor” or “editeur”. 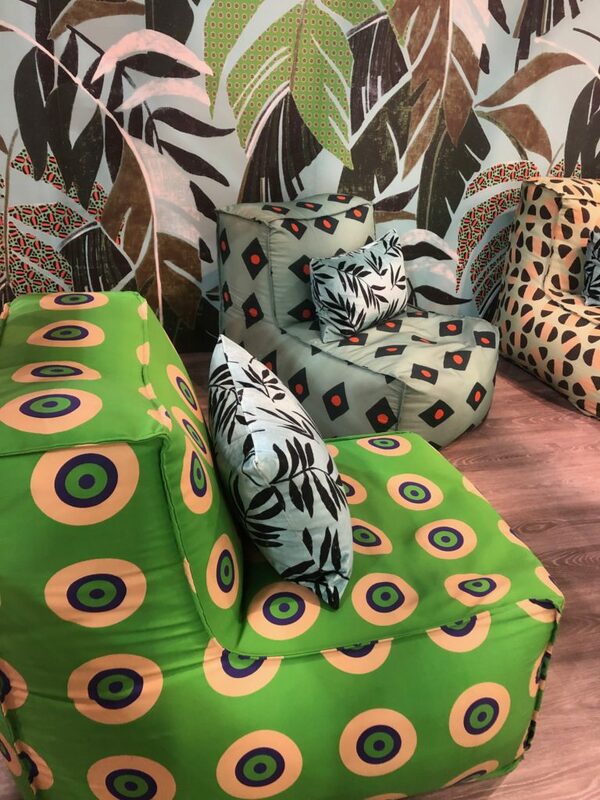 One of my favorite Dutch brands Moooi launched The Extinct Animals Wallcovering Collection with Arte each pattern inspired by the characteristics of one extinct animal. 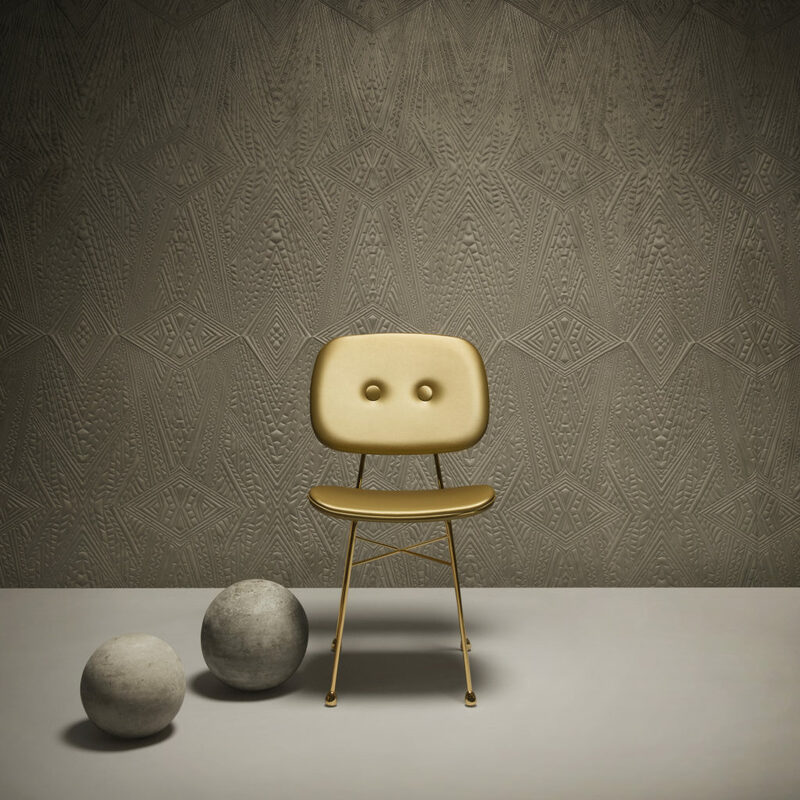 The Dwarf Rhino pattern is a soft suede 3D wallcovering, based on the unique structure of the animal’s ancient skin, bearing the appearance of a suit of armour. 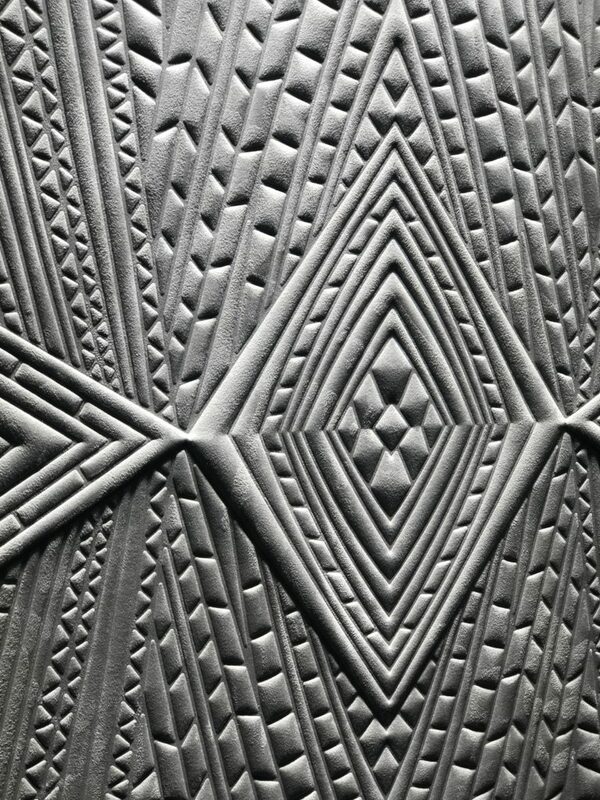 The three dimensional texture and pattern epitomizes the creativity and luxurious hand of the Embrace Indulgence trend. 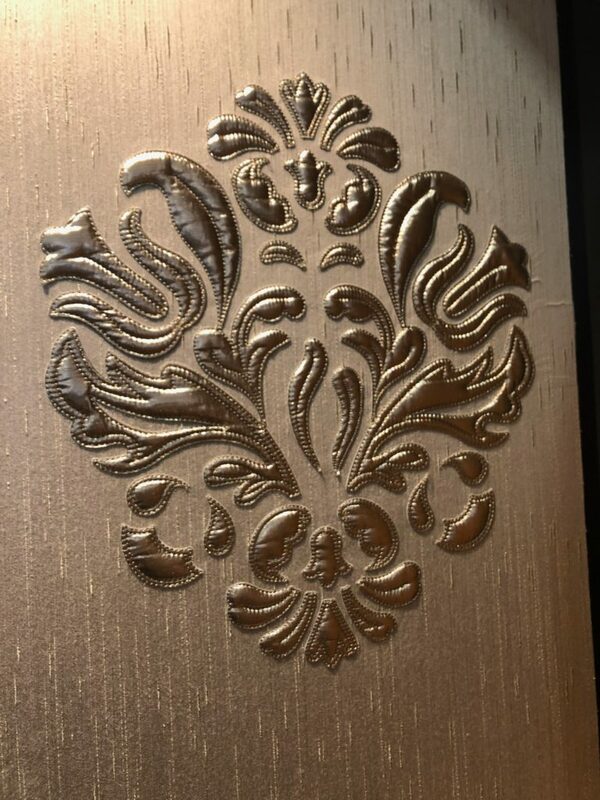 Wall tiles are artistically hand crafted in multi media, like jewelry, in Berlin at Welter. What I would give to visit Ulrich’s studio! He works in glass, sequins, beads, metal, clay, to name a few materials, and his work has embellished the stage of the Oscars, Emmys and Golden Globes. 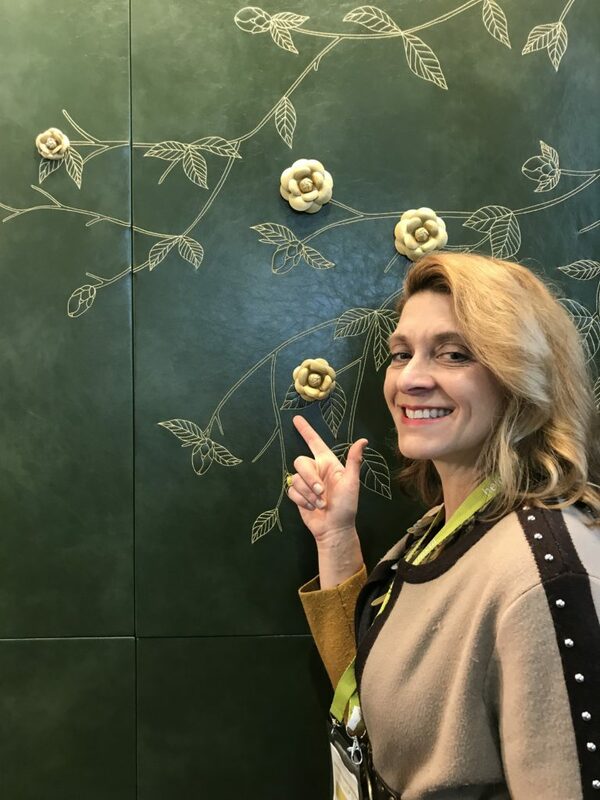 Embroidery and three dimensional flowers create modern embellishment for the wall at Kinland Decor. You will be seeing more of this wall-art trend in the year to come that can anchor a room with any style or emotion, this one, for me, is Seek Sanctuary. 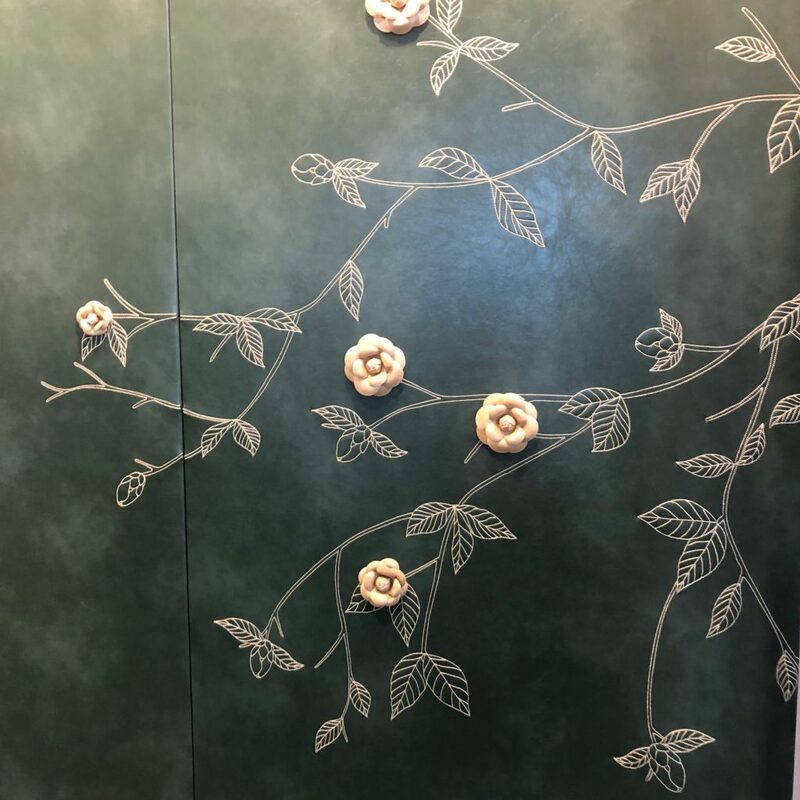 Embroidered wall covering with 3 dimensional flowers at Kinland Decor. 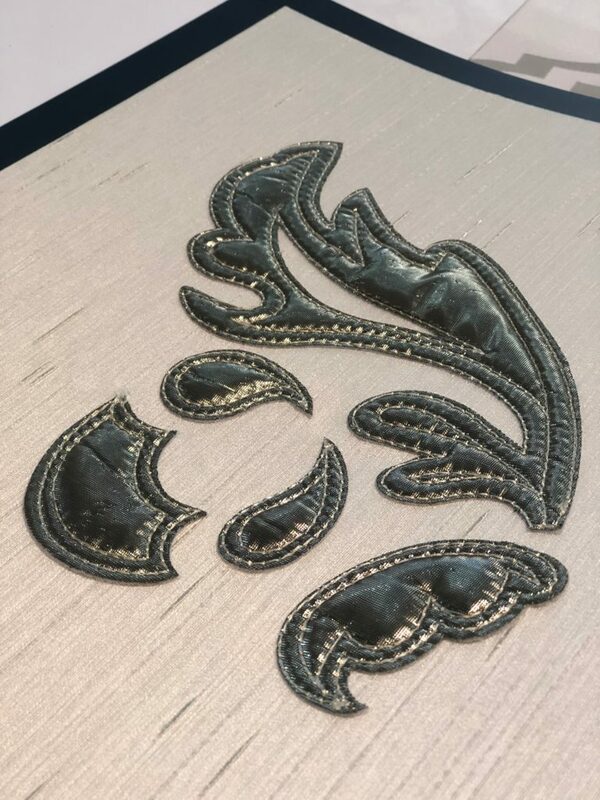 Raised appliqué that can be applied anywhere on the wall as a medallion or allover pattern brings dimension to wall decor. After four full days, I still didn’t cover every hall, but I felt accomplished. Clocking nearly 6 miles a day, I achieved what I set out to do — source, connect, learn, be inspired and fuel my trimmings design business and teaching for the next 12 months. 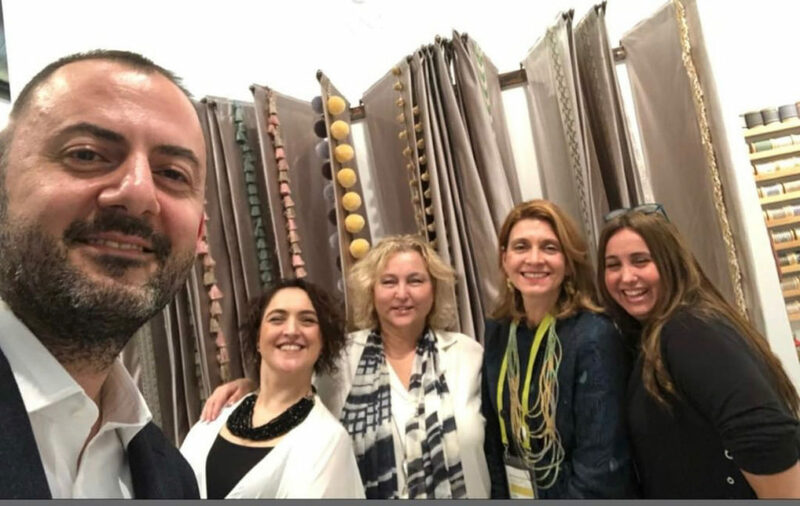 Heimtextil, thank you for this opportunity to visit Messe Frankfut and hope to see you next year! 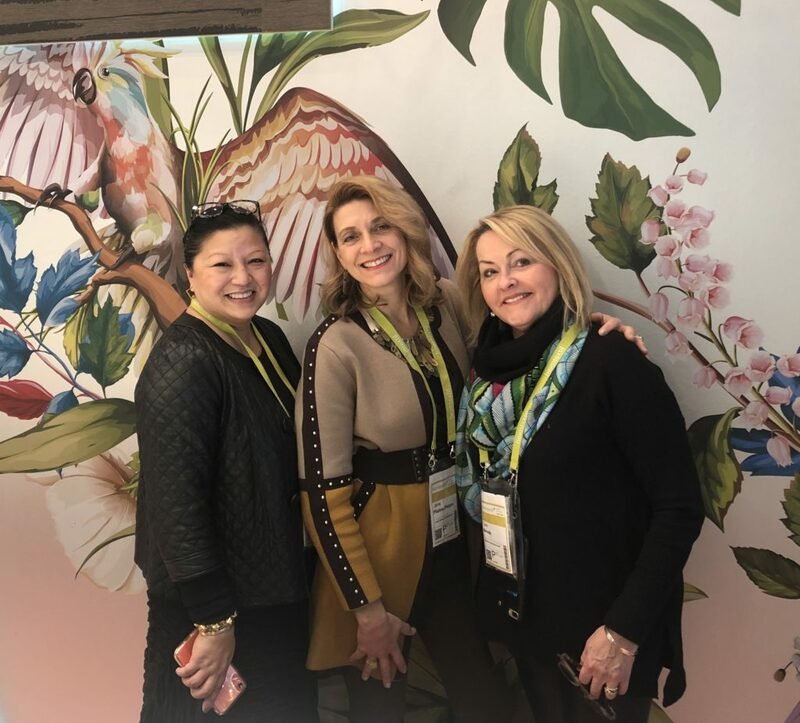 A big shout out to my fellow bloggers, peer mentors and travel buddies, interior designers Jeanne Chung of Stylish Cozy Chic and Lisa Mende The Design Connector who both made this fair extra enjoyable. Click to check out their unique coverage of the show. 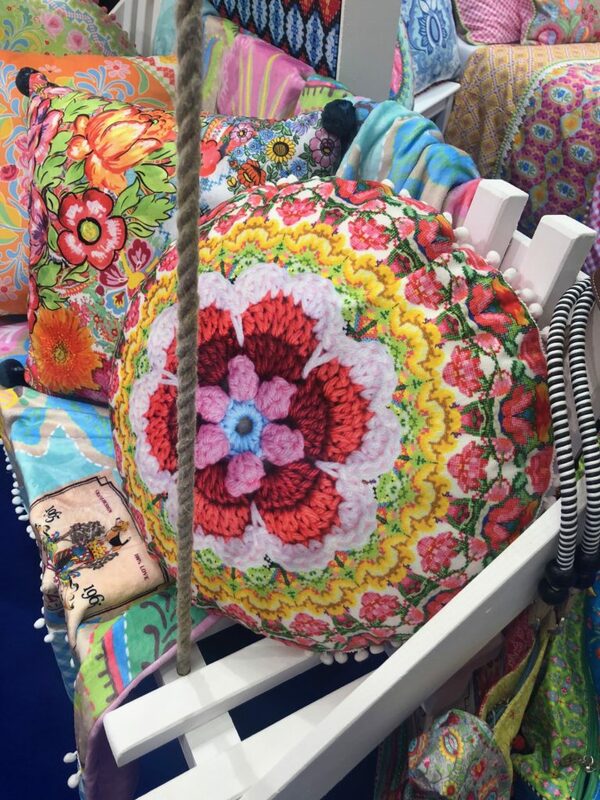 Danke schön Heimtextil and Messe Frankfurt! Thanks Deborah for taking the time! 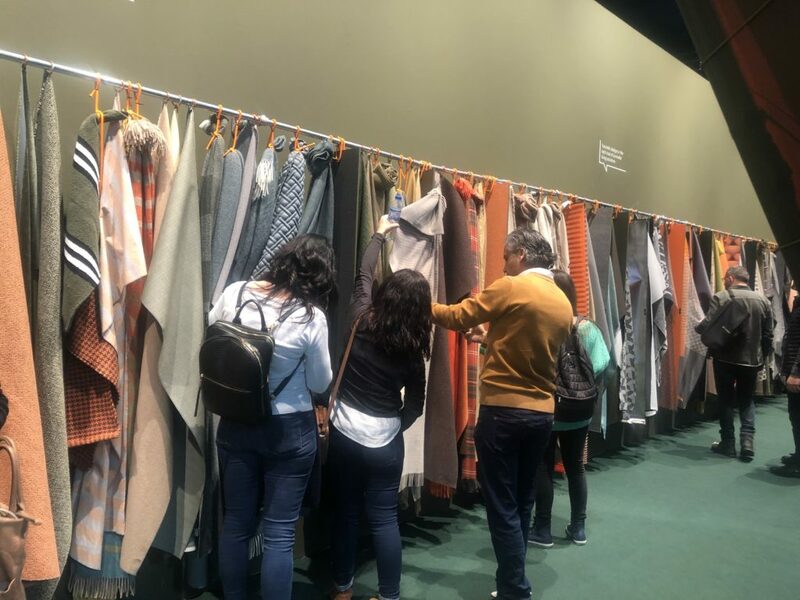 It was a fascinating and valuable show, getting the global view of the textile market, the creativity that drives it and the sales that keep it growing. Hope you have the oppty to go next year. Being an exhibitor at Heimtextil, I never really take the time to go around the fair. Thanks for this very interesting summary! 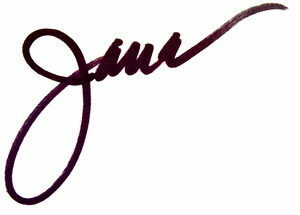 Jana – your eye for detail!!! 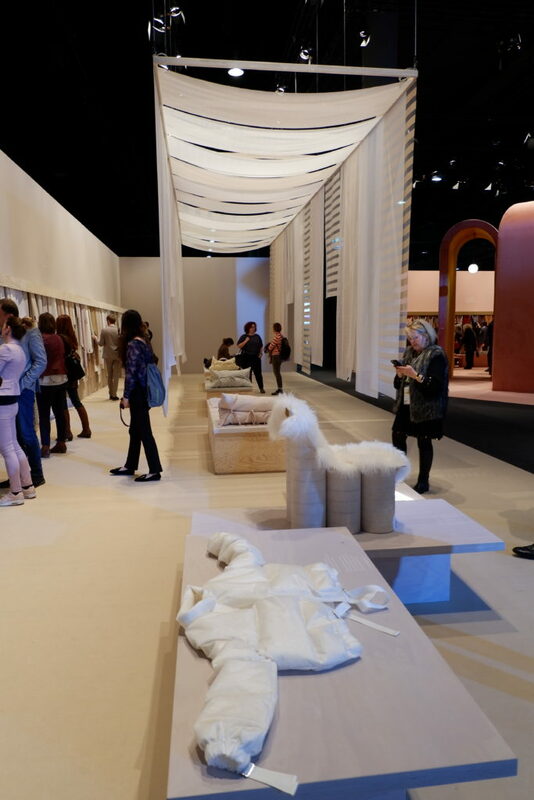 I loved re-living Heimtextil again and through your lens. It’s so interesting that each of us gravitate towards different elements of the show, and thankfully you covered much of what I missed! I look forward to many more adventures with you to feed our curiosity and desire for continued learning.. Thanks Jeanne for reading and also for the peer mentoring. You are so generous and I learn so much from you industry related and beyond! I loved your detailed report, technical and high minded both, you are truly an expert that we all look up to. Jana, What a great post. Since I’m working the fair I never get to see all the wonderful things that are in the fair, you sure captured it here. Thanks for sharing what I don’t get to see. navigate. Hope to return next year! Jane, What a great post, you sure captured it all. Since I ‘m working the fair I don’t get to see all the wonderful things that are in the fair. Thanks for showing me what I missed.